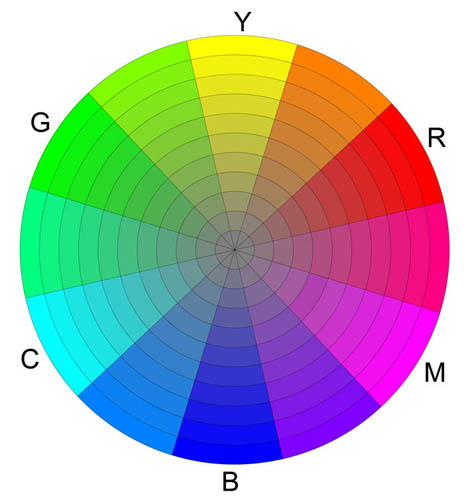 opponenttheory: Is that what a colour wheel looks like? Is that what a colour wheel looks like? The "Yurmby" wheel is a colour wheel that I have been using in my painting for a couple of years now since learning about it in Jame Gurney's excellent book Color and Light: A Guide for the Realistic Painter. It is constructed from the ideal additive primaries (green, blue and red) and the ideal subtractive primaries (cyan, yellow and magenta) which are arranged equidistant on a circle creating the additive complementary relationships (yellow and blue, green and magenta, and cyan and red). Because of these relationships this wheel is very useful in establishing colour relationships. I use this wheel in almost every miniature I paint (typically in the use of turquoise and red as shading colours) and I share this in the hope others may find use in this.